First you need to make some holes in the side of the bottle. 5mm holes in a line about every 30mm works well though it is not critical. Be careful the bottle is very slippery so the drill can slip. Make sure it can't slip into your hands! It also helps to use a smaller drill (3mm is good) to make the holes and then use the larger one to open them out. Cover the holes with a piece of tape (just to make filling easier and drier. You should find that you have a series of streams of water coming out of the side of the bottle. The ones nearer the bottom are faster and stronger than the ones at the top. This is all because water is a fluid, it is squishey, this means that if you squash it in one direction it will push out in all directions. 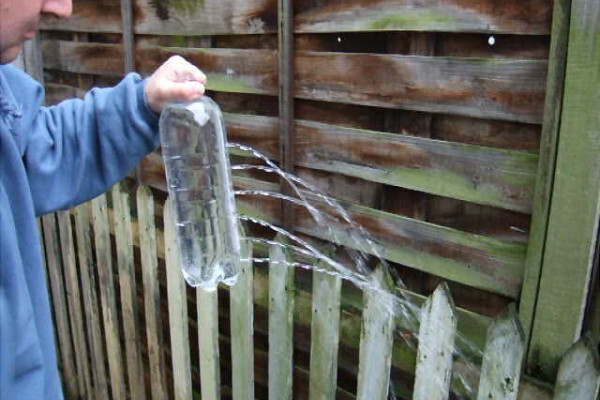 This is why when you squish water in one direction it squirts out the sides. In fact the pressure (force per square metre) is pushes out with is the same as the pressure it is being compressed by. Water is quite heavy so the water at the top of your bottle will compress the water below, so the deeper you go the higher the pressure. Every 10m you go under water the pressure increases by one atmosphere. This is why submarines and deep sea diving suits have to be so strong to avoid being crushed. This means that if you make holes in the side, the water next to the deeper holes will be pushed out much harder, so it comes out quicker and travels further. Water's will compress the water under it. So the deeper you go the higher the pressure. The water deeper down is under more pressure so it pushes out through the hole faster. This is also the reason that hydro-electric dams have to be deep. The higher the pressure the more energy a kg of water releases as it flows through the turbine, so if you have the same flow of river and double the height of your dam you will double the amount of energy you can extract. This is also the reason that hydroelectric dams have to be so high. The deeper the water, the higher the pressure so the more energy there is to extract. Why did you leave the cap opened? Why did you not close it? If you do not leave the cap off then the exiting water leads to a vacuum inside the bottle, which affects the stream of the water.